One of the Faculty Members of the Department of International Relations at Bina Nusantara University, Wendy A. Prajuli, published an article titled “Islamic ideas versus secularism: The core of political competition in Indonesia”. The article is as follows. The implementation of sharia law in Indonesia has been increasing ever since democratization in 1998. The country’s Kompas newspaper reported in August 2015 that there are currently 443 peraturan daerah (local regulations) related to Islamic law.1 This growth of Islamic ideas in Indonesian politics challenges the secular ideology that the nation’s foundation was based on, yet this Islamic challenge to secular Indonesia is not a new phenomenon; competition between Islamic and secular ideas has existed during every phase of the republic’s development. In reality, this rivalry is at the core of Indonesian politics. Another disagreement concerned the notion of nationalism as the foundation of the republic. For Islamic leaders, such as Agus Salim, Mohammad Natsir, and Ahmad Hassan, nationalism was considered to be jahiliyyah,4 it threatened the Islamic concept of Tawhid,5 and would lead to chauvinism. Salim believed that Sukarno’s idea of nationalism was chauvinistic and “enslaves man to the fatherland-idol, leads to competition and rivalry for the acquisition of wealth, honour and pride, to the suppression, enslavement and danger of the fatherland of others without regard to rights and justice.”6 In contrast, Indonesian leaders such as Sukarno and Cipto Mangunkusumo, appreciated nationalism for its potential to gain independence, and for its ability to bring together in one nation, people from different ethnicities, holding diverse ideologies, with various faiths or religions. By the late 1930s, the Islamic group started to come around to the idea of nationalism as well. 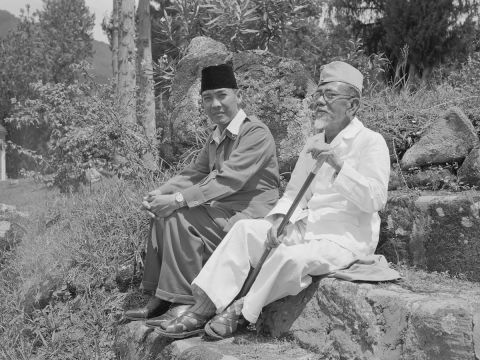 Prior to the declaration of Indonesia’s independence in 1945, another debate arose between the Islamic and the secular groups. The Islamic group rejected the then fifth principle of Pancasila,7 which was ‘belief in God’. The reason for this was that “Islam was being treated as if it were no more important than any of Indonesia’s other deist religions”.8 The debate concluded with, firstly, the release of the Jakarta Charter that contained the statement: “belief in God with the obligation for adherents of Islam to carry out Islamic law”. However, the Charter was never implemented because it was rejected by areas of Indonesia that were dominated by nonMuslims. Later, in 1968 as well as in the early 2000s, Muslim groups again attempted to apply the Jakarta Charter, but, on both occasions, its implementation failed due to insufficient support from others.9 The second and third conclusions of the debate were the change of ‘God’ into ‘God almighty’, and the switch of this newly-worded principle to be the first principle of Pancasila, rather than the fifth. Most of the Islamic notions that manifest themselves in local sharia law, as listed above, refer to normative issues, such as morality, attire, and faith. Furthermore, these sharia regulations can be grouped into three categories: those that regulate public order and social problems, such as prostitution, gambling, and alcohol consumption; those that are related to religious skills and obligations, such as reading the Qur’an and attending Friday prayer; and those that are related to religious symbolism, such as adhering to Islamic dress codes.16 This indicates a shift from the early period of the Republic where the dynamics were about ‘big issues’, for instance, the foundation of the State and nationalism. Sharia law has attracted opposition from some elements of society, such as law makers, human rights defenders and women’s groups. They consider it to potentially violate human rights as well as discriminate against minority groups. Public debates between the proponents and opponents of sharia law are frequent and usually controversial.